This is a T-shirt from the 1982 People’s March to London that saw thousands of young people converge on the capital to make the point that all over Britain – but particularly in the north – teenagers were out of work with no hope and no future. That outstretched hand sums up the desperation many were starting to feel. 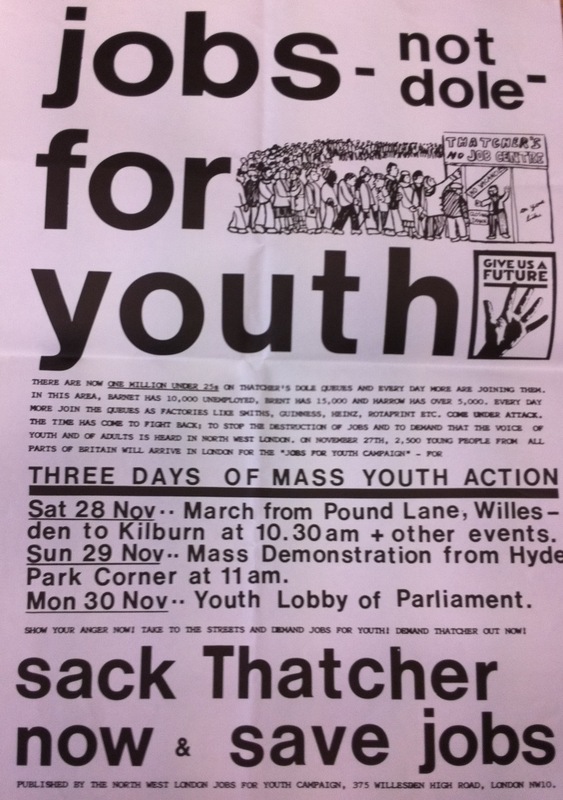 I lived near Toxteth in Liverpool in 1984 when 90% of those aged between 16 and 25 were out of work. Grim times indeed. One million young people found themselves on the dole in the grim recession that gripped Britain at the start of the 1980s. 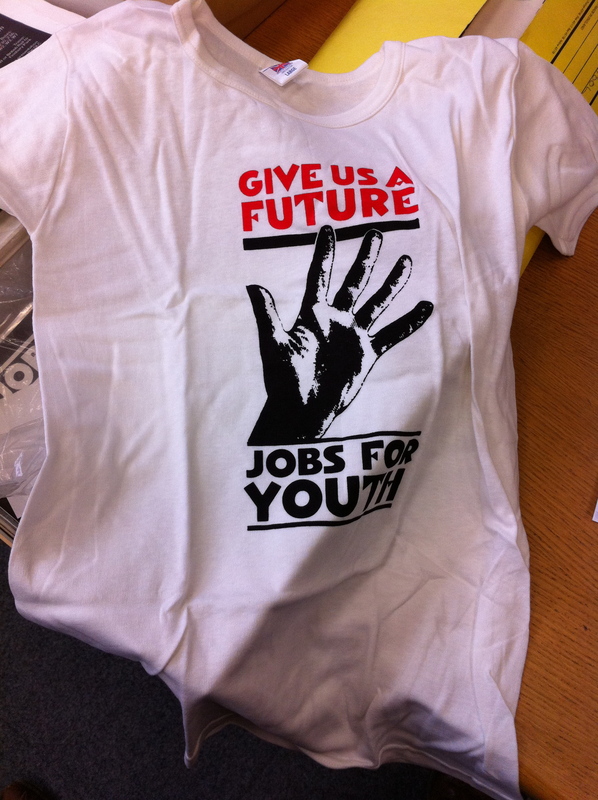 Jobs Not Dole was a familiar slogan at the time. Maggie, Maggie, Maggie – Out, Out, Out – a very familiar cry on the countless demonstrations. The monetarist economic experiment had resulted in mass unemployment – but for the Tories, it was the price that had to be paid. Young people are on the dole all over Europe once more – 50% of young people in Spain without jobs. It’s all a horrible echo of the 1979-81 economic downturn in the UK during the first term of the Margaret Thatcher government. I was at university in Liverpool from 1981 to 1984 and jobs were things that very lucky people had in that city. Disused factories and warehouses were everywhere. So bad was the situation that a bleak humour arose – evidenced by this front cover of the satirical magazine Private Eye in 1980. Here we have arch-Thatcherite Keith Joseph saying it’s not so bad – he’s spotted at least one job. I found a Pen Pals column in a magazine from 1981 with teenagers asking other teens to write to them. This was an era before Snapchat and Instagram. But it does show that even the pre-digital age, teens were hooking up with total strangers over long distances. However, this kind of hooking up was seen as a broadly positive thing in the 70s while its digital equivalent today causes concern and anxiety.